The latter two are factions of the Kuomintang split during the Lee Teng Hui era. In the AOL news today, there were pictures taken of a rally in Taipei where over 100,000 persons demanded a name change from REPUBLIC OF CHINA to TAIWAN. They were carrying a huge flag with them. This can not be a Taiwanese (proposed) national flag. It's a political rally banner for foreign press pictures. Unless the Taiwanese would change also the national language to English. Taken from a photography published in the 21/09/2003 issue of YZZK magazine. It shows a groups of people demonstrating in Taiwan while flying 2 types of flags: the first is a green-white-green pale. Judging by the AP photos posted to flagforum.skalman.nu it appears the emblem outline of Taiwan rather than the emblem illustrated. http://nihonnokoe.blogspot.com/2014/02/koe-107.html (Image) reveals that the smaller islands are also shown. The photo shows the flag with ratio of about 3:5. There are also images with other ratios on the Web, like here, but these are not verified by the photos yet. This flag became the prime symbol of the Taiwanese movement at the beginning of 2001. It is the flag of the World Taiwanese Congress (WTC), formally established in Taipei in March 2001 as the major overseas Taiwanese umbrella organization. Except for the central design (a green triangle over a green disc) and the presence of Chinese characters over it (I'd guess they might simply say "taiwan republic" as the text in latin script at the bottom). Incidently, you can see someone holding in his/her hand a small version of it so it is a flag, not a banner. The fact that they have retained the same colours (and in the same order) from the previously reported one means that there probably is some symbolism to it. Maybe something relating the Taiwan Independence Party. 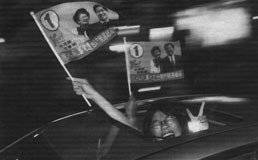 This a picture of a very happy Taiwanese citizen, waving a flag off the roof of his car. 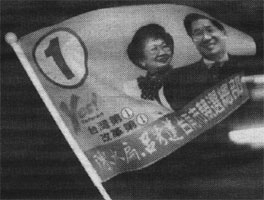 It illustrated an article on the victory of Chen Shui-bian in the March 2004 elections, and I strongly suspect that this is a short-lived campaign flag. See detail for the amount of writing it includes and the number 1, which is an electoral code. This is interesting because here whenever presidential elections are held, we also see lots of flags, but never flags that include the picture of the candidate, much less his wife (supposing that that's who the woman is). Flags here include flags with the campaign slogans and logos, of the parties and organizations that endorse the candidacies, the national flag also pops up every once and a while, other flags are also seen on occasion, but photos never appear. And it's also interesting because this topic of campaign flags is very poorly studied, probably due to the extreme brevity in each of these flag's life. White flag with green disc in the center. Green flag with hinomaru in the canton. White, red and green horizontal stripes. Recently I got three images from Japanese friend who often visits Taiwan on business. Three flags are used by pro-Japan Taiwan independentists. The green color in three flags represents Taiwan. In the horizontal three striped flag white stands for Japan, red for U.S.A. and green for Taiwan.